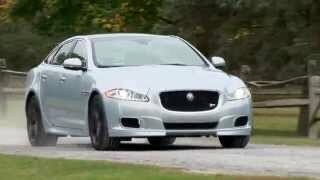 Jaguar unveiled the 2014 Jaguar XJR - a new high-performance model extending the dynamic flagship of the XJ series, at the 2013 New York Auto Show. 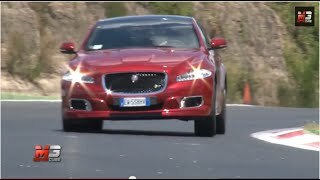 The new XJR epitomizes the three pillars of technology, performance and seductive design which the Jaguar brand stands for, while delivering new levels of dynamic ability in a luxury saloon. The XJR has a stylish exterior which comes with a new front bumper, aerodynamic sill section, additional rear spoiler, unique ‘R’ bonnet, a ventilated hood, a four-tailpipe exhaust system and 20-inch ‘Farallon’ forged alloy wheels with bespoke Pirelli tires. Exclusive interior materials, including semi-aniline leather, a choice of veneers and contrasting stitching on the seats, bolster the XJR's dynamic intent. 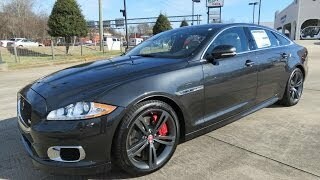 The 2014 Jaguar XJR is also equipped with a 12-speaker Meridian audio system and carbon fiber or piano black trim. 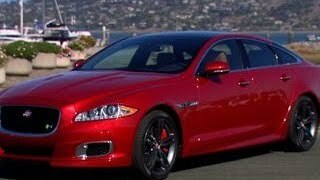 The 2014 Jaguar XJR is powered by a supercharged 5.0L V8 engine good for 550 HP (405 kW) and 680 Nm (502 lb-ft) of torque, which is connected to a ZF eight-speed automatic transmission. 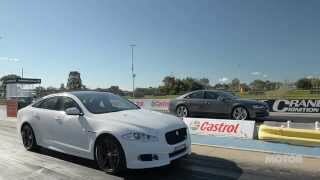 It helps the sedan to accelerate from 0-60 mph in 4.4 seconds (0-100km/h in 4.6 seconds) and hit an electronically-limited top speed of 174 mph (280 km/h). In terms of efficiency, it has a combined economy of 24.4 EU mpg (11.61/100km and 18 US mpg) with CO2 emission of 270 g/km.